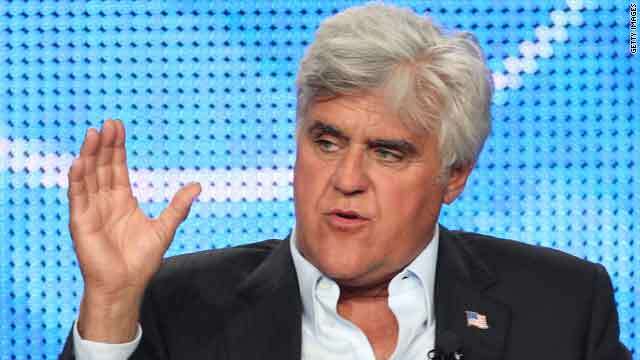 Jay Leno will move from prime time back to late nights, NBC said Sunday. NEW: Leno to host half-hour show starting at 11:35 p.m. ET; O'Brien moving to 12:05 a.m.
Los Angeles, California (CNN) -- NBC host Jay Leno is going back to late nights after a low-rated experiment in prime time, the network announced Sunday. Leno's prime-time talk show, which debuted in September, "didn't meet affiliates' needs," said Jeff Gaspin, chairman of NBC Universal Television Entertainment. The program will go off the air February 12, when the 2010 Winter Olympics begin. The network is now negotiating with Leno and its current late-night hosts, Conan O'Brien and Jimmy Fallon, to decide who ends up with which time slot, Gaspin said. O'Brien took over NBC's flagship "Tonight Show" when Leno moved to the 10 p.m. slot in September. Fallon took over O'Brien's former show, "Late Night." Gaspin said the plan now is for Leno to host a new, half-hour show at 11:35 p.m. ET, followed by "Tonight" with O'Brien at 12:05 a.m. Fallon's show would move to the 1 a.m. hour, he said. Do you think NBC did the right thing? The goal is to keep all three hosts, but nothing was a done deal as of Sunday, he said. Video: Moving Leno (again) a mistake? Reports of the shakeup first emerged last week. Leno dismissed them on his show on Thursday night, telling his audience, "It's always been my experience NBC only cancels you when you're in first place." Leno's move to prime time was a risk for NBC, because it put a talk show up against scripted prime-time shows and ran it five days a week. Network spokeswoman Rebecca Marks said last week that Leno performed "exactly as we anticipated on the network." But for NBC's affiliates, Leno's low ratings were taking viewers -- and the resulting ad dollars -- away from their late local newscasts. "The 11 o'clock news hours were bleeding ratings," said Stuart Levine, an analyst for the entertainment trade paper Variety. While NBC appeared to be fine with Leno's numbers, the affiliates "kind of revolted and said we have to have better ratings," Levine said. Michael Fiorile, the chairman of NBC's affiliate board, called the decision announced Sunday "a great move for the affiliates, the network and, most importantly, the viewers." "We admire their willingness to innovate, and their willingness to change course when it didn't work for us," Fiorile said in a written statement. For NBC, which had promised to give Leno a full year in the 10 p.m. time slot, "It's certainly a little bit of egg on the face," Levine said. Mediaweek analyst Marc Berman called the network's gamble on Leno "the biggest fiasco in the history of television." "What they didn't realize was that the people who watched Leno in late night were not necessarily the same people who watched in prime time, so there was no reason to believe that his audience would follow him to prime time," Berman said. Meanwhile, the O'Brien-helmed "Tonight" lost about half its audience "and actually really hurt late night, which is a big profit center for NBC," Berman said. Moving "Tonight" -- which has held its current slot for decades -- back a half-hour is likely to hurt the show, and Berman predicted that NBC will be unable to keep all three hosts. "My guess is down the road, they will give back Leno the 'Tonight Show,' leave it on at 11:35 p.m., and Conan will move to Fox," he said. "But if I was either one of those gentlemen, I would be looking elsewhere right now." CNN's Doug Hyde contributed to this report.